Australian Dental prosthetists are masters in the fit and construction of your new dentures. They are not a dentists, nor dental technicians, but professionals who consult directly with patients and provide dentures as well as other dental appliances. A Dental Prosthetist is an oral care professional who has completed extensive training to become firstly a dental technician, who works by referral from a Dentist, and finally a Dental Prosthetist who is registered to consult patients directly. An Australian Cosmetic Dental Prosthetist is registered to undertake the manufacture of complete dentures, partial dentures and mouthguards. 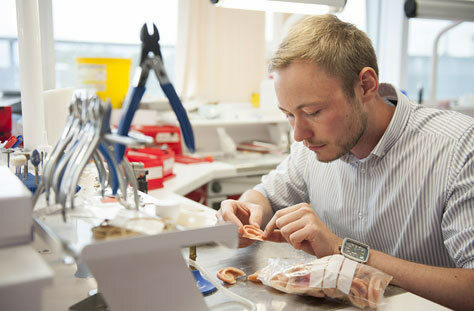 When you put yourself in the care of an Australian Dental Prosthetist you can be secure in the knowledge that you are being looked after by a health professional with the most comprehensive knowledge of advanced techniques, new materials and the latest world trends in the field of denture prosthetics. Under the new national laws Dental Prosthetists are able to practice in every State/ Territory in Australia. Technicians are technical experts in fabricating dentures; however they are not qualified to provide their services directly to patients. In general, they are not trained to understand oral physiology nor have the insight of how your jaw or bite functions. While dentists are highly experienced professionals, and do have the expertise to fabricate dentures, they outsource denture fabrication to dental technician labs. This means that information relayed can be translated incorrectly leading to dentures that don't fit properly and also doesn't give you a great personal experience. If you are in the market for any kind of denture, call for an appointment. We guarantee a personal, one on one experience that will leave you confident knowing you are dealing with a denture specialist. WHAT IS A DENTAL PROSTHESIST TECHNICIAN? including crowns and bridges (combining the expertise of a technician and practical dentistry). Translates two-dimensional design diagrams and written instructions (from Prosthesist or Dentist) into three design programs and written instructions into three-dimensional products based on accepted principles. Make appliances for patients with cleft palates, braces and plates for correcting irregular teeth and mouth guards. Dental technicians may work independently, in hospitals, in dental laboratories or for dental group practices. They use a wide range of materials and techniques in their work, including plaster casting, electro-spot welding, laser welding, metal casting, sandblasting, metal polishing, electroplating, wax modelling, wire bending and ceramics. There is an increase in the use of small CAD/CAM units to assist in the design and manufacture of some dental products. Dental technicians usually have no direct contact with patients unless they undertake further study to qualify as dental prosthetists. Health Services does not currently employ Dental Technicians for technical work. Technicians working in specialised areas, such as crown and bridge, and work associated with the increasing occurrence of cosmetic dental surgery. Technology. Entry to the diploma course usually requires Year 12. Applicants must also have employment in a dental laboratory for technical work training, which will commence after enrolment. Take high school courses in Health, Biology, Chemistry, Mathematics, English, Industrial arts and Computers to HSC level. Apply for work experience in a dental laboratory. In order to practice as a dental technician, graduates must be registered with the Dental Technicians registration board or the Dental Registration board of the state or territory in which they intend to work.